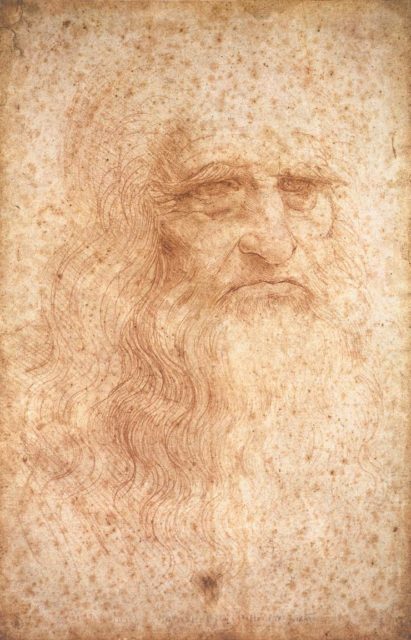 Self-portrait by Leonardo da Vinci. Even though Leonardo detested violence and preferred to focus on creating beauty and furthering human understanding, he still had to appease those wealthy patrons who made it possible for him to pursue his own interests. One of those patrons was Cesare Borgia, according to a discussion on da-vinci-inventions.com. 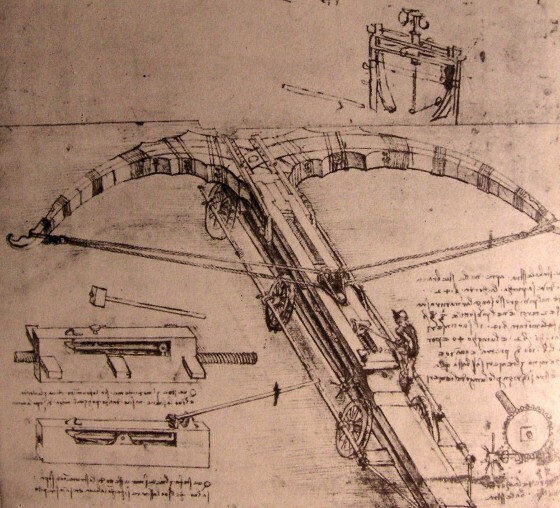 Da Vinci’s inventions for Borgia were both for offensive and defensive purposes, and ranged from the world’s first machine gun to impenetrable fortresses and drawbridges. Da Vinci sketched this rolling artillery battery around 1480. 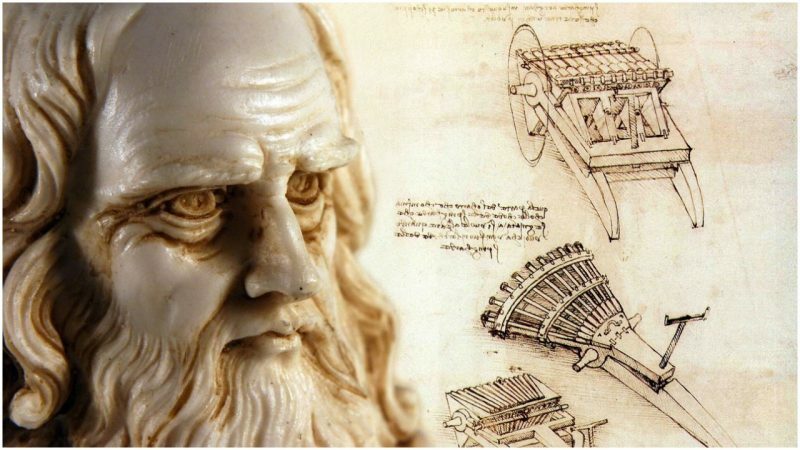 Leonardo Da Vinci was a student of military engineering, both classical and current. He said once, in a letter to Ludovico il Moro Sforza, that, in addition to his other skills, he was proficient in nine of nine areas of military engineering. In his list, he included bombardment machines, machines for drainage ditches, bridge building, and new weaponry. One of his inventions was a triple-barreled cannon, which was a forerunner of the modern machine gun. According to the Daily Mail, a real-life example of this weapon was discovered by school children playing in an old Croatian fort. In 2011, forty years after its discovery, it was confirmed to be a Da Vinci design. Archaeologists assume that the cannon was brought there by Venetian forces, as Venice controlled the area at the time and was in conflict with the Turks. 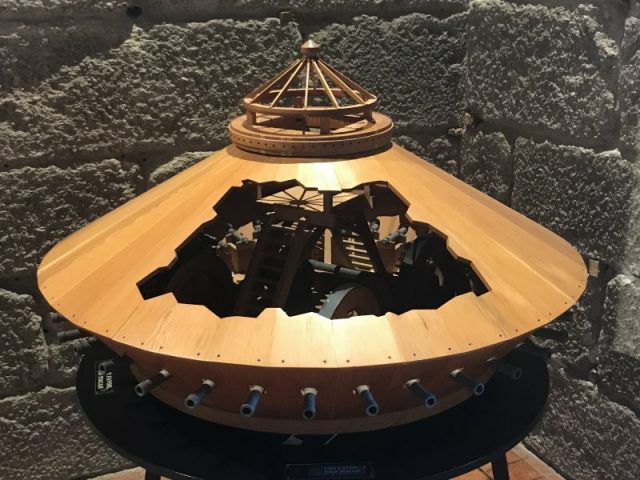 Although we can assume it wasn’t one of his most successful designs, since it was abandoned there, it is thought to be the only remaining example in the world of a weapon made from Da Vinci’s designs. 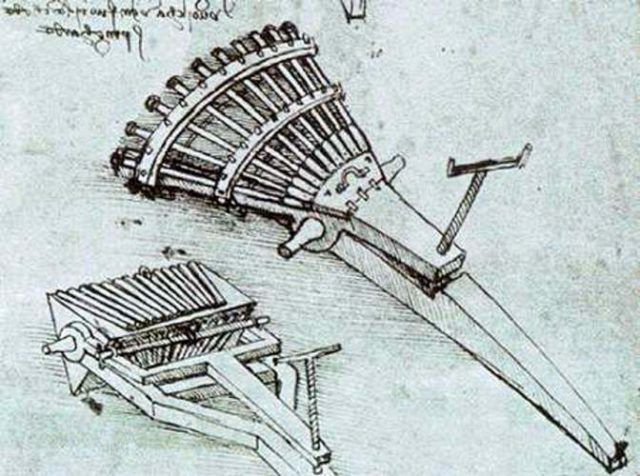 Da Vinci also created a 33-barreled organ (a combination of guns), according to Leonardo Da Vinci Inventions. Da Vinci was of the opinion that one of the most preeminent problems with using cannons was that they were slow to reload. His solution was to create a design where the gun could be fired and loaded at the same time. The organ had three rows of eleven guns each, attached to a rotating platform. The original design of the giant crossbow (Codex Atlanticus, f. 149a). When one row of guns was empty of ammunition, the platform could be rotated so that a new row of guns was immediately available, and the empty one could be reloaded. 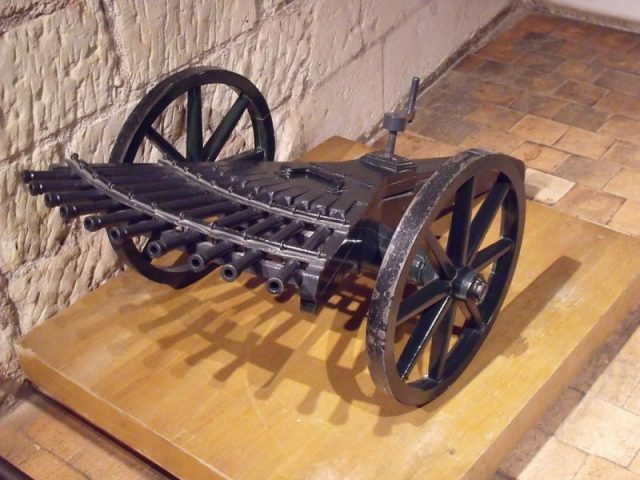 This weapon is an ancestor of the modern machine gun. 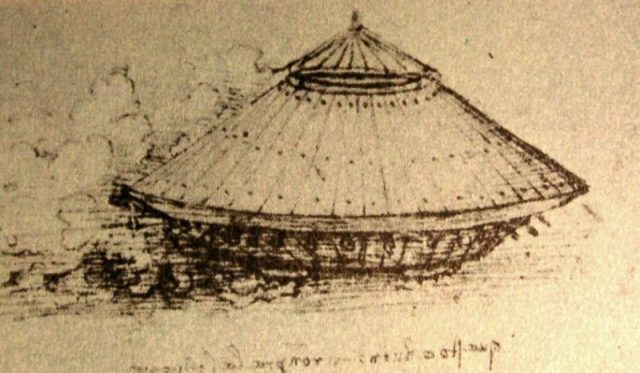 Leonardo da Vinci, design for a fighting vehicle. He even conceived of an armored car, an early precursor to the modern tank. It had a number of light cannons mounted on a circular platform, and could shoot in any direction. The platform was protected with a cover reinforced with metal plates, and its position could be adjusted to better protect against enemy fire. Its motion was powered by eight men inside it, turning cranks which would then turn the wheels. This eliminated the possible problems of having it drawn by horses which were vulnerable to attack. The design had a serious flaw, however. The cranks for turning the wheels were made to go in opposite directions; consequently, forward movement impossible. Scholars think that this was an intentional design flaw, since by report, Da Vinci hated designing weapons of war. In the course of his career, he designed other inventions for military use as well, but these are the most remarkable.